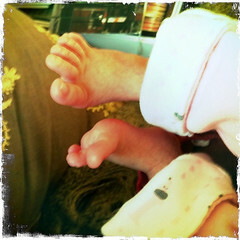 Okay, I have a thing with baby feet. I CANNOT put socks on baby feet! I was the exact same way with Cate. Be honest: if you got the Christmas card of our family with the picture of a sock-less Cate two months after she was born, did you think to yourself “that baby needs socks?” If given a chance, both of Cate’s grandmothers would put socks on her and then I would immediately take them off. Meh. You are in a heated home and if her feet were freezing you would take care of it. I totally understand and think you should enjoy those teeny toes as long as you can! No worries in my opinion.